Every year, there are thousands of animals that are abused, abandoned or left homeless. With your help we are able to find them the loving homes that they so desperately need. If you're looking for a new pet, please visit the SPCA rather than a pet shop or breeder. Not only will you save a life – when you adopt a pet from the SPCA you know you are getting a healthy, sterilized animal. Every dog and cat offered for adoption has been thoroughly examined at our clinic, de-wormed and innoculated. We also have a strict sterilisation policy that ensures pets are only re-homed after being spayed or neutered. We feature cats and dogs available for adoption on our Facebook. Please click on the buttons on the lefthand side of the page to view our dogs, cats, puppies and kittens available for adoption! Pssst! Adoption Open Days happen on alternate Sundays! Please contact our friendly staff to find out when our next Open Day is scheduled for! Once you have fallen in love and chosen the pet you would like to adopt you need to fill in the Adoption Application Form. Thereafter one of our inspectors will visit your home to conduct a yard check to ensure that your future pet is secure (high enough walls) and has shelter (a kennel) etc. Once the yard check and has been passed, the cat or dog will be sterilised (if older than 6 months) and will then be ready to go home with you! If younger than 6 months, the kittens and puppies can be taken home and brought back when they are old enough to be sterilised. · Sterilization is 100% compulsory for ALL cats and dogs adopted from us. Out of District Adoptions: Our SPCA does adopt outside of our area but prospective adoptive families need to be able/willing to travel to the kennels in person to meet/collect the dog/cat and for their local SPCA to have conducted and passed a yard check first. SPCA rules also prohibit non sterilised dogs/cats being adopted outside of our district. You can fill in the papers in the meantime, but you need not email or fax them through yet. You can bring them with in person when you come to meet our dogs and cats. Please note that our adoption procedures need to be followed in order for an adoption to be successful. THE FIRST STEP IS TO VISIT US IN PERSON. You cannot adopt a dog or cat that you have not yet met in person, unless by prior arrangement (due to living in a different city/province etc). 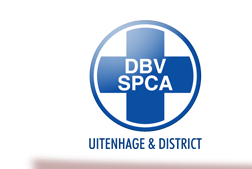 Please email the completed form to info@uitenhagespca.co.za. Please list the kennel number and the cat or dogs name in the form and mark it for the attention of Marion or Clarissa. Are you feeling a bit blue? Are you in need of a heart warming "pick me up"? The you must read some of our AMAZING adoption stories and view photos of the animals and families whose lives have FOREVER been changed. Click on the photos below to read some of our happy homings!